Python dynamic programming language includes the OOPS concepts of. It possesses unique syntax in comparison to Java, C, and C++. Also, you can learn it in a simpler and easier way. Most of the developers work on the latest frameworks to create apps quickly. Within the frameworks, they create codes and develop web or mobile applications easily. The framework allows a definite structure to the web developers or mobile developers. So, they can focus well on the main logical requirement of the application. Python supports a broad range of frameworks. Generally, two types of Python Frameworks such as Full stack and Non-Full stack frameworks which help develop an application. Let’s discuss these types of Python Framework in details. Web2py is a cross-platform python based open source web framework. It’s a completely free-to-use Python framework, released in 2007. It enables developers to create Python dynamic web applications. Develop, debug code, test and maintain web apps by components debugger, code editor, and deployment tools. Also, its ticketing system issues a ticket instantly to the user at the time of error occurrence. Hence, the user can track the error status easily through this ticket. A cross-platform framework that supports Windows, Mac, Linux/ Unix, Google app engine, and many more. Also helps embed jQuery for Ajax and UI design. Doesn’t need extra configuration and installation and also, can read different protocols. Contains built-in components that handle HTTP requests and responses, sessions and cookies. Follows the MVC pattern and supports role-based access control and globalization. Also provides sufficient security to data against threats such as injection flaws, cross-site scripting, and infected files execution. Django is a full stack open source Python framework which was released by Django Software Foundation. It’s an absolutely free web framework, released in 2005. It enables developers to create critical codes as well as apps in an easier method. Also, It has a huge collection of Python-based libraries that makes developers efficient. This happens due to component reusability with lesser code. Finish your required apps within the lesser time in comparison to other web frameworks. You will find the DDY (Don’t Duplicate Yourself) principle and an MVT (Model View Template) architectural outline. ORM maps the instances to the database tables like SQLite, MySQL, PostgreSQL, and Oracle. Hence, the developers can transfer the code from a database to another database. It also supports web servers and that’s why famous companies use it. Some companies are Mozilla, Pinterest, Instagram, Disqus, Bitbucket and The Washington Times. TurboGears is a full stack open source data-driven Python framework. You can use it free-of-cost with components such as SQLAlchemy, Genshi, WebOb, and Repoze. With this framework database connectivity is much faster in comparison to other frameworks. Also supports Pylons web servers and numerous libraries. Consists of WSGI components. For example, its ToscaWidgets helps embed any complex widget in the application. 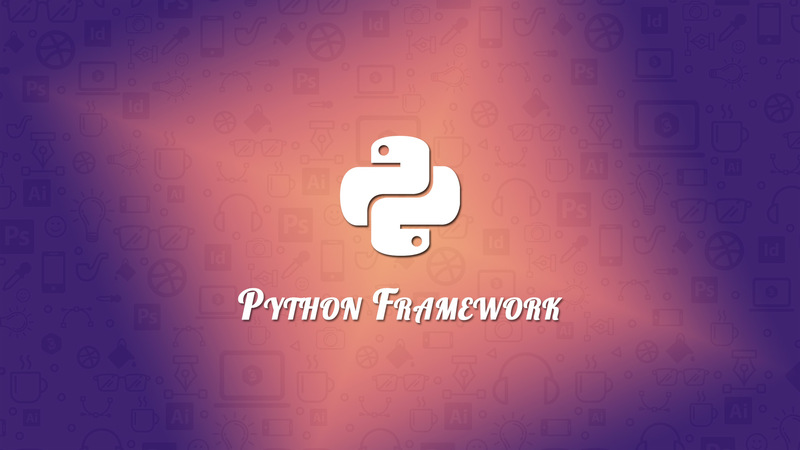 Some full stack Python frameworks are Pylon, Giotto, CubicWeb and many more. The bottle is a lightweight, small or micro Python framework. Developers build small size web applications through it. It creates a specific source file of each application and only depends upon Python Library. Contains a built-in HTTP server that renders adapters for WSGI/HTTP servers and template engines. Also, allows request-dispatching routes with URL-parameter and supports for plugins of various databases. Allows users to upload a file, form data interaction, cookies, and other metadata in an easier way. CherryPy is an open source and oops based non-full stack Python Framework. Developers create Python applications with this CherryPy framework. It also contains multi-threaded web server and runs on any OS like Windows, Mac and Linux/Unix. Contains an HTTP/1.1 compliant, WSGI web server and web servers like Apache and IIS. Contains tools for encoding, caching, and authorization purpose. Supports profiling, examining and coverage and contains a built-in plugin system. Some non-full stack python frameworks are Flask and Sanic, etc. In sum, Python has a broad opportunity for the development of the latest machine learning based web application. Developers can many critical projects with these frameworks.